Americans taken hostage in Algeria: Barack Obama should follow his own foreign policy doctrine in dealing with Mali and its blowback. Let the Obama doctrine lead the way. Photograph by Eric Feferberg/AFP/Getty Images. Insurgents allied with al-Qaida mount an assault on southern Mali. The French send troops and launch air strikes to stave off the attack. Islamist militants seize a foreign-owned gas field in Algeria (whose government had let the French planes use its air space) and take at least 20 westerners hostage, including two Americans. Bin Laden is dead, we’re pulling out of Afghanistan, we’d like to be through with insurgency wars generally—but insurgency wars, it seems, aren’t through with us. So what is to be done? And who should do it? First, this confrontation, while nerve-racking, should not be oversold. The jihadist affiliate that’s linked to the Mali insurgents, known as al-Qaida in the Islamic Maghreb, has nothing like the muscle or global reach of bin Laden’s flagship in its heyday. Nor are these insurgents all jihadists; many are simply criminals, drug smugglers, or sectarian warlords who have joined the fight opportunistically—and thus might be peeled away from the fight as well. Second, this pattern is hardly new. Islamist militias of one sort or another have been present in Mali for a long time; they took control of its northern half a year ago. Few took much notice. Still, the incidents of the past few days—the militants’ attempt to flex their grip southward toward the capital city of Bamako, followed by the hostage-taking in Algeria and the threat to “open the gates of hell” (as one of the rebel spokesmen put it) for France and any other country that gets in their way—are concerning, to say the least. Hence, French president Francois Hollande’s rapid dispatch of troops and warplanes to halt the onslaught. And while Malians have mixed feelings at best toward the French, who were once their colonial occupiers, they welcomed the intervention with gratitude; for without it, they certainly would have been overtaken and terrorized. Where things go from here is less clear. The French regard their action as a short-term rescue operation—a holding action until an alliance of neighboring nations (members of the Economic Community of West African States) gather and deploy roughly 3,000 troops. But it’s not at all clear how long that will take, or how well they can fight once they arrive. For this reason, France has asked the United States for assistance. Should we comply? If so, how? And so there are many hot spots in the world where the Obama administration (sometimes President Obama himself) has ordered commando raids or drone strikes on “high-value targets.” In the case of Libya, he joined a NATO military campaign (which had been requested by the Arab League and authorized by the U.N. Security Council) but did not lead it. Rather, the United States focused on providing its “unique capabilities” to the warfront—especially drones (both for providing surveillance and dropping smart bombs), long-range airlift of supplies, and some on-the-ground intelligence assets. This is what some uncharitably called “leading from behind,” and it proved successful. That’s probably the sort of thing we will do in Mali—and what we should do, if France’s rapid counterblow doesn’t stave off the threat. Even this is not as easy as it might seem: air bases are far, far away; drone operators need local people on the ground to tell them where to aim the cameras and what they are looking at. Whole logistical and intelligence networks need to be created. Even if Obama were inclined to do more, say, to send troops (which he almost certainly is not), he couldn’t, owing to a law barring U.S. troops from aiding a foreign government that came to power as the result of a coup. 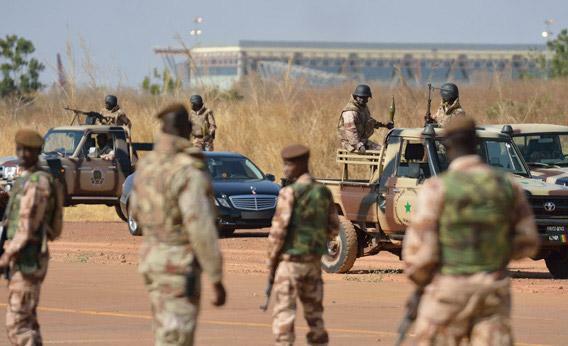 And it’s worth noting that the officer who overthrew Mali’s democratically elected government just last year, Captain Amadou Sanogo, had been, not long before, a promising student in a U.S. Army training program. This should give further pause to anyone advocating major action on our part. We don’t know the territory, we don’t know the players, we don’t know who’s worth backing, and who’s not. There are others who do, and they happen to have a bigger stake in the conflict. One lesson we should have learned in the last decade (and in much of the half-century before that) is that, in these sorts of cases, where we’re so in the dark, we should keep a low profile, if we get involved at all.